Dr.B.R.Ambedkar Open University has released the notification for degree admissions with out any educational qualification but, the candidate should cross 18 years up to 1st July 2019. According to the notification an eligibility test will be conducted at both Telangana and Andhra Pradesh states. Dr. B.R. 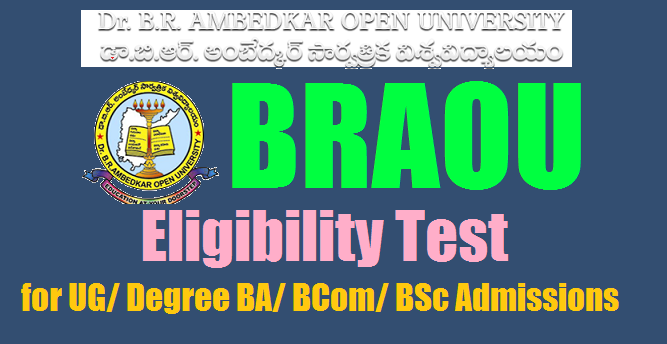 Ambedkar Open University (BRAOU) had issued the notification for Eligibility Test 2019 for admission into B.A. /B.Com/ B.Sc. for the academic year 2019-20. Candidates can apply for Eligibility Test before the last date. Candidates can check the complete details, of BRAOU Eligibility Test 2019 such as application process, eligibility criteria and information. (c) Approach the nearby Study Centre with date of birth certificate/school leaving certificate , along with a latest passport size photo for confirmation. (d) Provide the required information through University website and fill your ET-2019 Registration form through “online” and upload photo and signature. (e) After receiving the SMS from concerned study center, than only the candidate has to Pay Rs.300/- (Rupees Three Hundred Only) by debit/Credit Card through University online OR Rs.310/- (Rupees Three Hundred Ten Only) at the TS/AP online Franchisee Centre towards Registration Fee and obtain receipt. (f) Collect a print out of Registration Form from the University website and retain it for your reference along with fee payment receipt. 1. Candidates wish to appear for ET shall register through ‘On-Line’ from our own website i.e., www.braouonline.in. So, Interested candidates can register their names from university portal www.braououline.in through online. 4. Through www.braou.ac.in candidates can give their required information athrough University website and fill your ET-2019 Registration form “On-line” and upload photo and signature. Website (www.braouonline.in) . Hall Ticket can also be collected in person one day before the Examination from examination Center chosen by them. 1. The Candidates are requested not to make any cash payment at Dr. BRAOU Study Centers. 2. The Registration Fee must be paid through debit/credit card or any TS/ AP ONLINE FRANCHISE CENTRES ONLY. 2016, 2017 and 2018 and could not take admission into the U.G Programmes so far, need not appear for the Eligibility Test -2019. They can seek admission into 1st Year U.G. when Notification is given for Admissions in May/June-2019 tentatively along with the candidates who possess Intermediate or its Equivalent Qualifications. 4. Visit the University Website for the complete list of Study Centers, Information Brochure on ET2019 and also Model ET Question Papers. For further details, pl contact: 040 – 23680240 /246 / 254 / 241.
c) Date and Time of Eligibility Test : 28th April, 2019 10.00 A.M. to 12.30. P.M.